To do this test, you need about 20 hairs which you have shed, and a metric ruler. We're assuming that hairs you've shed while washing or on your clothes are a "random sample" meaning they are hairs from all over your head and therefore there is a good chance that these represent your hair in general. If you take hairs from only one part of your head, you may get a inaccurate result. 1) Dip the hairs in clean water to rinse them and make them pliable. No knots! Cut them to a manageable length if they are quite long. 2) Line up 10 of the hairs in a drop of water or a drop of hair gel (the water will help them stay in place and prevent them from bending or curling). Pack them as closely as possible without overlapping - use a straight pin or toothpick to press them together. Make sure you count how many hairs you are using. You're going to pack them more tightly than you probably think is correct. Just don't let them overlap. If you do not press them very tightly together, you'll get an estimate which is too large. 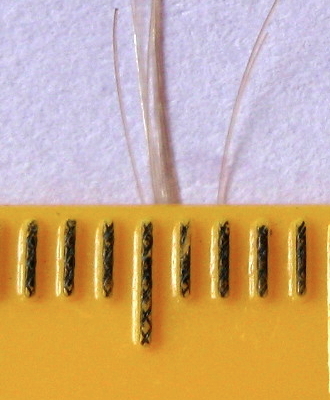 You'll create a very solid little sheath of hair. There should be no gaps or air spaces. If your hairs are very curly, weight them at each end and gently pull them straight. If you have tightly-curled hair with many kinks, apply coconut oil or another oil to the hairs to make them pliable. Then refer back to the list. 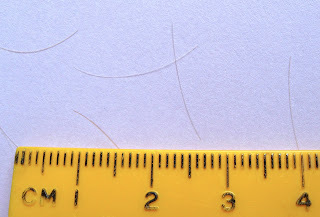 15-16 hairs or more pack into a millimeter: Your hair is fine. 10-12 pack into a millimeter and you are pressing them tightly: Your hair is medium. 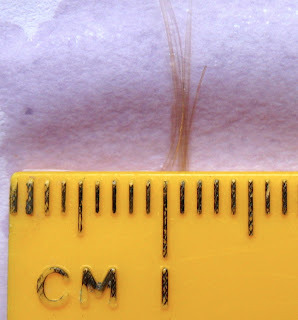 10 hairs pack together within a millimeter: Your hair is either medium and has kinks that prevent close packing, or it is coarse. Fine hair is silky when healthy. It bends easily, it is dented easily by ponytail holders and hair pins. It is easily flattened by weight of water, oils and conditioners or or other hairs. Think of milkweed down or little-kid hair. Medium hair has a little more structure. It resists bending a little more than fine hair. Medium hairs are easier to see individually and feel between the fingers - but medium hair behaves a lot like fine hair. In reality, it seems medium and coarse hair are often mixed together on the same head. Coarse hair resists bending. It feels strong between the fingers and is quite visible, even against a similar-colored background. Hair that may not look coarse can give away its coarseness by being very buoyant (in the air) when it's well-hydrated. This picture if of fine-medium hair. 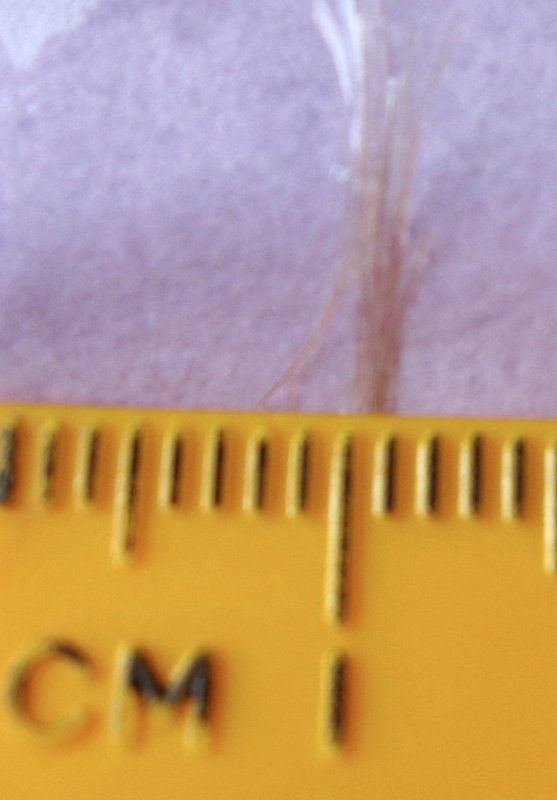 I packed 12-13 of these hairs into one millimeter. You can see it wet, but there's a photograph of the hair dry too because it photographed better. smaller marks is one millimeter. Oops. I made a gap when I put the ruler down. photo is in better focus. I suggest using water to hold them in place. A word about kinks in hair. Anybody can have kinking in their hair strands. This may be subtle widening and narrowing of the hair shaft. It may be a subtle twist in a similar motion to wringing the water out of a wet cloth. Or it may be lots of tiny bends. You may feel these when you run your fingers over a strand of hair as bumps or roughness, but you may or may not be able to see them. Is this method completely accurate? Sorta. It's difficult to handle individual hairs, difficult to pack them close together and difficult to get a good reading on a ruler when we're looking that closely - look at how wide those lines are compared to the actual hairs! But it might get you close. If you pack those little hairs in tightly and also take into consideration the way your hair behaves as well - it should give you a good estimate. You can always have hair which is in-between. Measurements are only as good as the technique of the person doing the measuring. If you feel you got the wrong result, try it again, try it with the hairs dry instead of wet, use a hand lens (magnifying glass) to see your work. The trickiest part of this method is to get the hairs to stay in place.